Scientific Background: Calcitonin gene-related peptide is a 37 amino-acid vasoactive neuropeptide (MW 3789) widely expressed throughout the central and peripheral nervous system. CGRP has potent vasodilatory effects probably serving as a regulator of regional blood flow, in addition to a variety of other cellular effects. 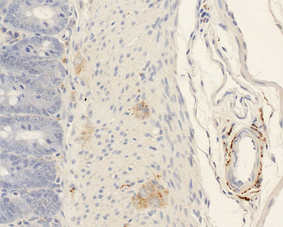 Immunohistochemical analysis of paraffin embedded rat tissue stained with alpha-CGRP (human), mAb diluted 1/400 in 1% BSA/PBS and incubated over night.